I'm quit new in this world and i have several doubts about the comunication of EIP. I'm trying to capture the comunication betwen a CJ2M and an NS8 HMI. I was trying with MolexEIPtool, so i could understand better the communication process and i did a little. Here is the wireshark capture of an get all attributes request: CIP_Molex_tool.pcapng (The last two packets are another unconnected request). I can see the request for list services, the register sesion request and the Forward open request. Then, i can see the request for service "get_attributes_all" and how the cj2m responses with all the attributes. Finally, the forward close request. 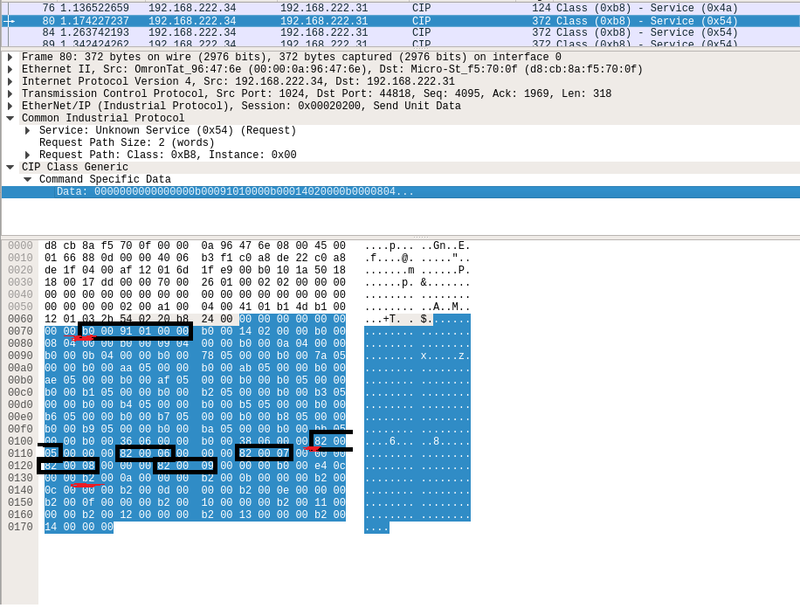 I can see that the packets are "SendUnitData", so i think it is a connected transmision, but wireshark cant decode the rest of the frame, so i dont know whats going on. Do you know the communications are set to EtherNet/IP? It may be set to FINS protocol. The thing is, betwen the CJ2M and NS i guess the comunication is on EIP (the packets are TCP), but wireshark does not know how to decode it?? When i did the same with Molex EIPTool it knows how to do it. I dont understand really whats going on. Omron NS-Series HMI can supports both FINS and EIP protocol, depending on which is selected during program design of the HMI. Seeing the packets between CJ and NS in your capture, it uses Omron specific Class ID and Service Code (I see 0x54 there) which is non-standard EIP Packet. That's why Wireshark cannot decode it since the resulting packet is unique to Omron. 0x54 I believe is about finding list of available Network Variables. I cannot say for sure though, since this specific packets are not listed anywhere on any Omron manuals. Did your NS and CJ already connecting? I mean like can you read any value of a memory inside the CJ from the NS screen? Because I believe if you already reading at least on memory, it will show different Service Codes, like 1C, 1D, 1E, 1F, depending on what kind of data you are reading. I suppose you are trying to replicate CIP Protocol that NS uses to communicate with CJ PLC? Yes, the PLC and the HMI are connected and they communicate perfect. It reads values from the memory and show those in the screen. Yes i want to replicate the the traffic betwen the PLC and the HMI, and identify the values read from de PLC. I'm trying to find any manual from Omron to know about the special codes, but i didn't find anything yet. 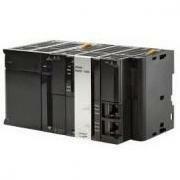 Your best bet is with Manual number W465-E1 which is manual for Omron CS/CJ Ethernet/IP Master Units. It should be available in most Omron websites as long as you have a user account (which is free, try the industrial.omron.eu since you're in Spain). From this manual go to Section 9 then 9-2-1 where you can find list of PLC Object Services. This basically lists all CIP Service Code that you can use to read/write memory of a certain type. The manual itself covers about how you would interpret the message using PLC Program, but you can use it as a base to generate your own CIP Package. OK, thanks innoale, i will try with the manual and see what can i do. I'm comming with another issue. I'm stiil working in my problem but this time i have another one. When i connect my cj2m to cx-programmer, i cant undestand anything. Its a FINS communication or EIP? wireshark cant decode nothing. But cx-programmer works perfect. Communication type will depend on how you setup the Network Type in CX-Programmer. I do not know for certain, but Ethernet/IP setting MAY be FINS commands in an E/IP message. All Omron PLC that supports EIP also supports FINS protocol (Omron dedicated protocol, which @gtsuport mentioned about the manual above). Looking at your Wireshark capture, it is definitely FINS. No CIP protocol being used at all. If you want to see how CX-Programmer communicates through CIP, don't use the Auto Online button when connecting to the PLC. Instead, use the Ethernet/IP Node Online button. It is to the second button to the right of the Auto Online button. 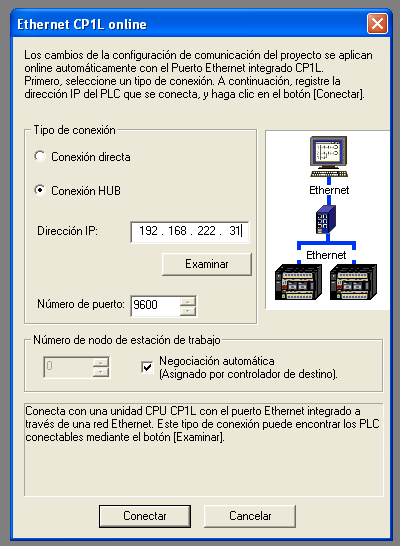 Alternatively you can right-click on the PLC Name, click Change, then set the Network type to Ethernet/IP. I think @jeskudero is snooping the packet, just to learn more about EtherNet/IP (If I am reading this correctly). Summarizing some things that have been stated above and adding a little: When using Explicit Messaging within EtherNet/IP, vendors have the flexibility to encapsulate whatever format they choose into a packet. For instance AB, uses something called PCCC (Programmable Controller Communication Commands) between some of their products when using EIP Explicit Messaging. Omron has chosen to use FINS commands within the EtherNet/IP packet. Basically the NS asks the PLC for Addresses for each of the Tags and then uses those addresses within a FINS command in an EIP Explicit Message. As stated above, if you are trying to understand EIP, this is not the best thing to snoop. Look at Implicit communications between two devices (a PLC to an I/O module for example) to understand better. Thast rigth Michael Walsh, i want to learn more about comunication in this PLC enviroment. How can i take a closer look of an implicit comunication with my equipement? I have an educational sample of SMC called ITS-200 (https://www.smctraining.com/webpage/indexpage/197/C1527706618), and it has 3 CJ2M with a NS series HMI, and the I/O modules are directly conected to de PLCs body or rack . Samplel photos (https://www.smctraining.com/es/webpage/indexpage/199). It says that with the "examinar" button i can analyze the network for searching, but i read that with static IP (i have static IP for the 3 PLC) it doesnt work. Whats the diference betwen this two methods? I am assuming your PLC is CJ2M-CPU3 something? Try to click on Browse (Examinar in your case) before connecting. At times you'll be asked to select the Network Adapter first. Maybe it is set default to your Wireless. Ok, i found the problem, i was working in an XP machine as a user without administrators rights, and the browse options didnt work, i tried it with admin user and it could see the PLCs list, and i can connect. Resuming a little bit, when I connect via CP1L it does with FINS protocol ( i tough this protocol worked with UDP), and with EIP node online it does with Ethernet/IP protocol. When the CJ2M communicates with NS HMI, it does with Ethernet/IP but encapsulating with specific FINS commands for omron? Thanks a lot, you are helping me so much! Correct. Actually the CP1L method is intended for connection with CP1L-E Series PLC which doesn't have USB Port but have an Ethernet Port which doesn't support Ethernet/IP. But since all Omron PLC supports FINS anyway, you can connect to CJ2M via that method also. It's the other way around actually. The FINS Protocol is encapsulated by the Ethernet/IP Protocol. Actually NS also can be configured to talk with the PLC via FINS only without the Ethernet/IP function. I took another reading at the CIP_OMRON file you attached in the first post, and I think what you are seeing is not packet data between NS and the CJ2M PLC. Instead, it is a packet between your PC with CX-Programmer with your PLC via Ethernet/IP. If you are using a Network Switch, Wireshark will not be able to read the transmissions between NS and CJ since a switch won't broadcast the data packets to all connected device, only to the targeted one. You may have a better luck if you are using Network Hub instead which just throws away packets everywhere, or if you have a Managed Switch it's usually possible to forward packets to another port or even broadcast it. Since you are learning it (and I'm in a good mood during Chineese new year :D), I just put another note to let you know what's happening actually if you are connecting NS to CJ PLC via Ethernet/IP. You might able to observe this activity if you have a Hub or Managed Switch as I mentioned above. Basically all of this happens using Explicit Messaging. NS doesn't use Implicit Messaging as you've mentioned above. You can compare the jargons here with EtherNet/IP Manual Book. 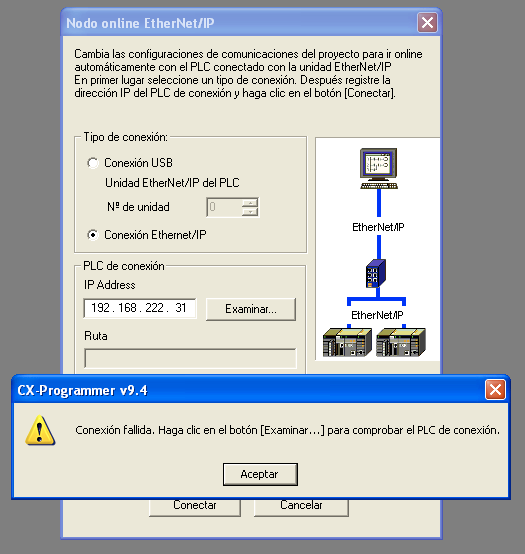 Should the PLC supports Ethernet/IP Explicit Message, it will reply with "Communications" Response. Cyclically NS will throw "SendUnitData" Request to the PLC to either Read or Write data on PLC Memory. This is where the FINS Command is encapsulated. You will also not able to decode it via Wireshark since the Service Code and ClassID used are Vendor-specific value to Omron. But if you managed to sniff the packet, you can see the FINS Command at the very end of the line. Also, if you managed to get SysmacGateway software, you can use it as a PLC Memory Emulator in your PC, which also support Ethernet/IP. This way, you can connect NS HMI to your PC instead of actual PLC and sniff the data via Wireshark easily. I'm performing a MiTM attacks, so i can put myself betwen the PLC and the HMI. Thats not the problem. i have understood this procces, I could see how it worked with MolexEIP Tool. The big problems is the 8th point, i'm always seeing "SendUnitData" (requests and responses) frames but i cant undestand the FINS commands encapsulated inside. Awesome! Then back to your Wireshark capture, you can try to look at the CIP Requests which sends out 372 bytes. Hello @innoaloe, i can see it better now. I can see the five DM memory request that i was searching, and i supose all the other memory addreses that the NS is requesting. Where can i get a manual to identify the b0 -> CIO, 82-> DM, ....?? I Found them in the manual W342! Additionally, i wrote to omron and they say me that the codes 0x54 and 0x4a that i see in the captures are not from them.